Howdy amigo ! I am Dahlia Latorre, an ESL Instructor over 6 years. Who enjoys teaching Korean student. 안녕 친구 ! 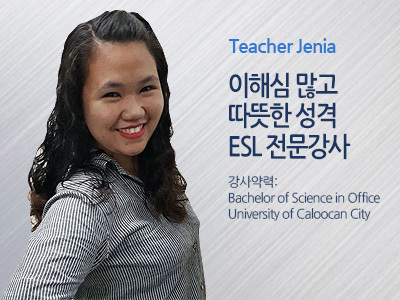 나는 Dahlia Latorre이고, 즐겁게 한국학생을 가르친 ESL 강사로써의 6년의 경력이 있습니다. I was born and raised in Quezon City. 저는 Quezon이라는 도시에서 태어나고 자랐습니다. I took up Bachelor of Science in Tourism in Our Lady of Fatima University. 저는 파티마 대학의 관광학 이학사를 받았습니다. I started my online teaching career in year 2012. 저는 2012년부터 온라인으로 가르치는 일을 시작했습니다. In my free time I like to sing, I like to travel with friends or with family, I like to take selfies hahaha I just love myself. How about you? 저는 저 자신을 사랑해요. 당신은 어때요? > I’m able to cope up with failures and learn from my mistakes. > 저는 실패를 극복하고 실수로부터 배울 수 있습니다. > I can make my class more enjoyable. > 저는 수업을 더 즐겁게 만들 수 있어요. > I can deal with more than one task at the same time. > 저는 동시에 한가지 이상의 일을 할 수 있어요. > I have high self confidence. > 저는 높은 자긍심을 가지고 있어요. > I’m an open minded person. > 저는 개방적인 마음을 가진 사람입니다.